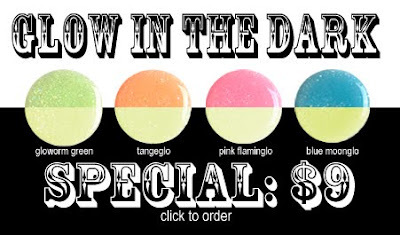 Diamond Cosmetics is running specials on Halloween colors and glow in the dark polishes! These are available on the specials page at diamondcosmetics.com. While they only offer shipping to US residents, those needing international purchasing options can use this post for reference. Mickellerox: So true! I am looking forward to trying these. They look amazing! jaljen: Thank you for the reminder! I will edit the link page. Ooh, glow in the dark!